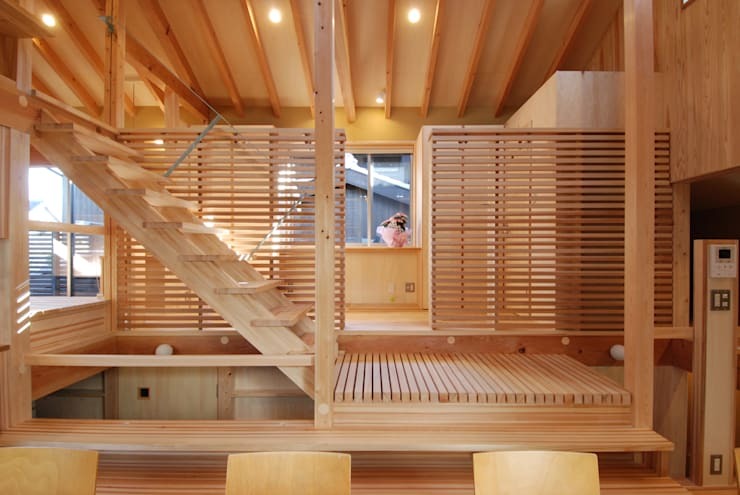 This beautiful, Japanese abode showcases a surprising and unique design, with its simple, terrace facade giving way to a glowing home, constructed and finished in streams of pale timber! 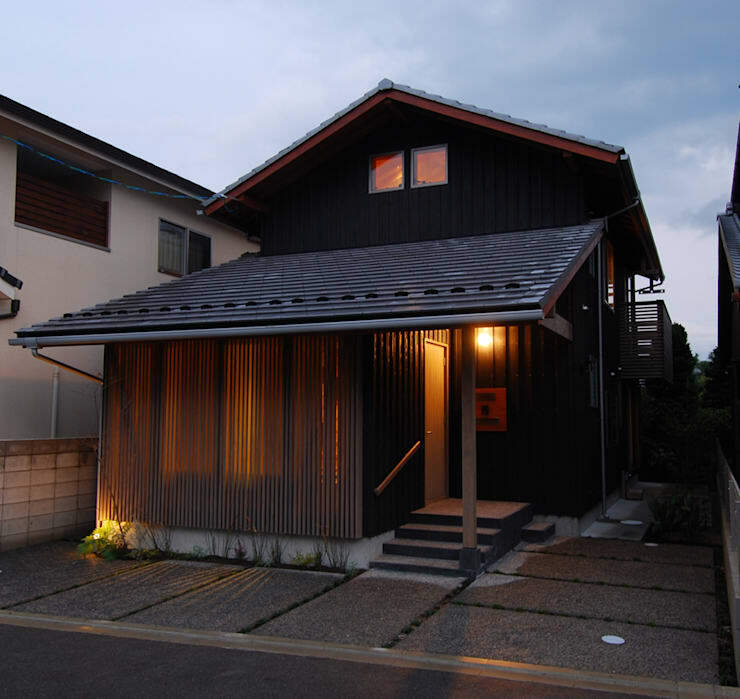 The brainchild of Kyoto's Toyoda Design, the home presents a striking exterior, with its dark facade of black steel and tiles and an enclosure of wooden slats intriguing from the street. Upon entry, however, the house is an absolute eye-opener. The golden tones of pale timber stream throughout, with clean lines and the intricate patterns of woodgrain defining the aesthetic. The kitchen and dining areas are entirely constructed of timber, with simple furnishings and finishes adding contemporary sophistication to the design. 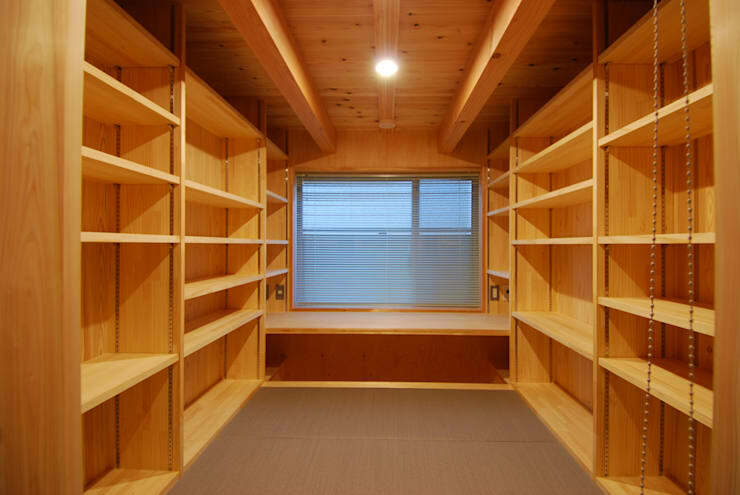 Beautiful carpentry is prevalent throughout, with impressive craftsmanship seen in the construction of delicate timber partitions, and a range of storage has been included, with plentiful shelving incorporated into the lower level of the home. 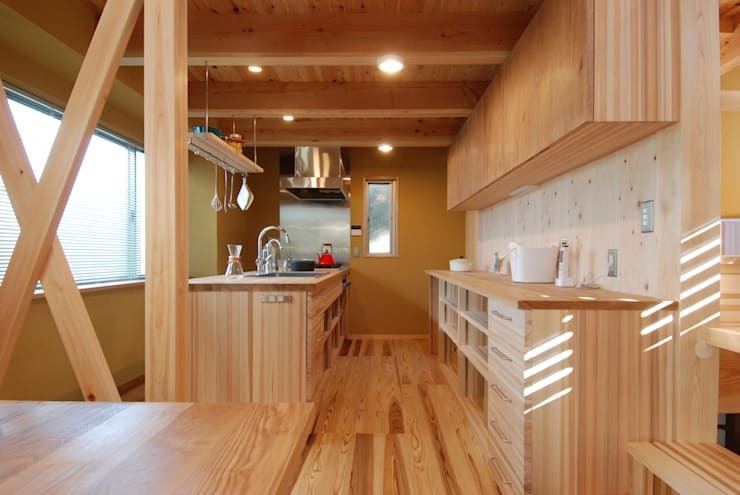 This house wonderfully combines creativity and functionality, and displays modern carpentry at its finest within the confines of classic, Japanese design. The facade of the home appears dark and intriguing, with soft light warming the exterior as its narrow, streamlined proportions flow back into the distance. An enclosure of vertical wooden slats juts out, crafting a point of interest from the street, while the upper level has been constructed of darker materials, with black steel and tiles used to striking effect. Upon entrance the external colour scheme is inverted, with pale timber predominating throughout the decor, anchored by the chic black of the tiled floor. The house does indeed stream forth, with the lengthy, wooden construction housing multiple rooms and spaces for storage. The pale tones of the timber glow and shine beneath bright lighting in a celebration of the extraordinary craftsmanship found within this unique abode. Up a small flight of stairs and we come to the living area, which flows with the clean lines of its timber boards and panels. 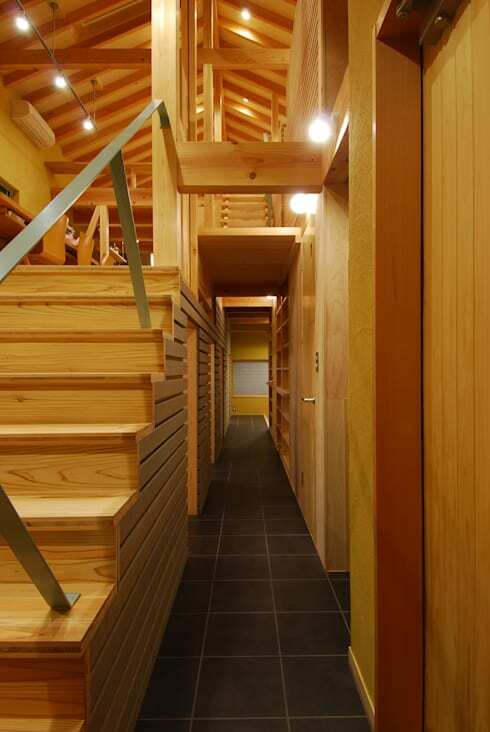 Timber clearly predominates within the space, although the complementary tone of the yellow walls provides a subtle contrast. A wooden dining setting sits in peaceful simplicity, blending beautifully with the overall theme of the home and presenting a sleek locale in which to sit and enjoy a meal or entertain friends. Moving through the home and we can see that the primary means of contrast incorporated within this design is amongst the finish and construction of the wooden interior, rather than between the wood's tone or type. This section breaks from the solid surfaces streaming through the dining and kitchen spaces, employing instead a raft of smaller slats to create the entryway to a mezzanine level and two internal partitions which section off a hallway. Light flows in through the large windows opposite, with the exterior of the home seen in the distance. The kitchen is chic and modern, with the pale tones of its wooden decor contrasting beautifully with the subtle sheen of its silver and stainless steel appliances and finishes. The plentiful storage included blends within the space, with the kitchen's shelves and drawers each adding to the streamlined effect of the room, and a series of simple, smooth cabinets practically camouflaged overhead. The lower level of the home also includes a range of rooms that can be used as bedrooms or storage areas. This space surprises in its design, with its subdued, textile flooring surrounded by a crowd of adjustable shelving units, presenting an open and functional area for storage. A large window allows sunlight to stream in and illuminate the timber finishes throughout, while a simple bench flows beneath, covering an indented storage cavity. 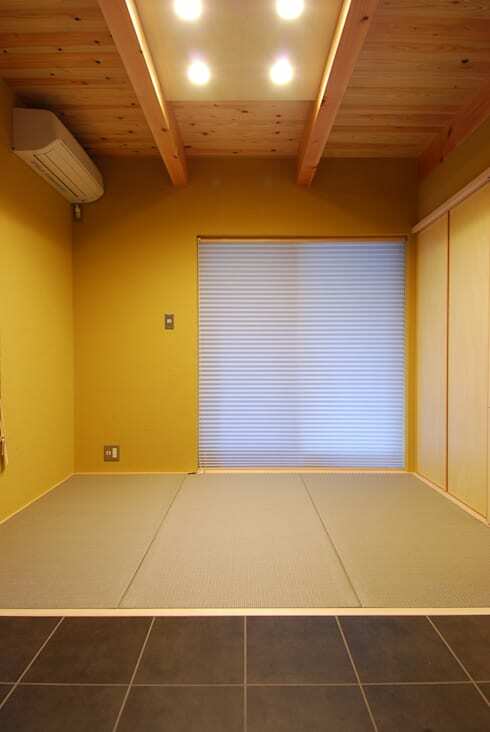 This bedroom pairs the glowing yellow walls seen in the dining and kitchen areas, with classic, Japanese matted flooring, presenting a departure from the prevailing timber decor seen to far. Black floor tiles provide a sharp colour contrast within the room, while a large window leading outside presents a portal for natural illumination. Timber hasn't been forgotten in this space however, with the strong beams and panels of the ceiling tying the room to the theme of the remainder of the home. If you enjoyed the glow of this lovely, wooden home have a look at A Family Home Full of Light! 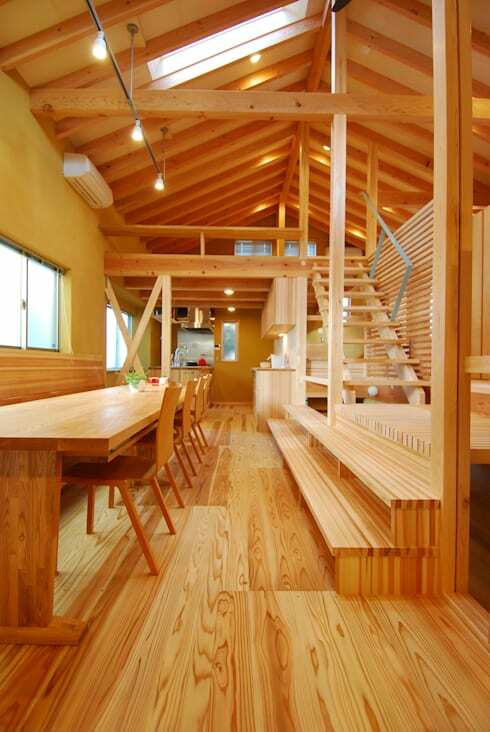 Do you enjoy the prevalence of wood featured throughout this home? Tell us your thoughts below.